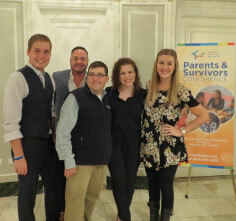 Survivors Bob, Scott, Kevin, Annie and Casey enjoyed the opportunity to network and learn about each other’s journeys. Throughout the day, they participated in sessions about self-advocacy, celebrating survivorship and their roles on their healthcare teams. Thank you to everyone who joined us in Chicago to attend the 2015 Parents and Survivors Conference. Videos of the conference presentations will be available soon. Thank you to A Kids’ Brain Tumor Cure Foundation (aka The PLGA Foundation) for their generous support of the 2015 Parents and Survivors Conference.